Despite the shutdown, the National Weather Service is putting out forecasts and helping local officials prepare for dangerous weather, even as employees worry about making ends meet at home. The weather clearly does not care that the U.S. government is partially shut down. A series of storms has thwacked California, the Midwest and large portions of the East Coast in the past week, dropping rain, downing trees, coating roads in ice and burying cities in snow. An ongoing storm is expected to drop up to 2 feet of snow in parts of New England this weekend. Of course, we know all of this because despite the government shutdown, the National Weather Service is still publishing timely forecasts and warnings that newspapers, TV meteorologists, weather websites and local emergency officials rely on. "We are basically doing the same job we were doing before the shutdown. We just haven't gotten a paycheck," says Ray Martin, a senior NWS meteorologist in Sterling, Va., who is that office's union steward for the National Weather Service Employees Organization. "I can't tell you how many times in the office I've heard the comment, 'Just going to work like usual, not getting paid!' It's definitely taken a hit on the morale." Under the best circumstances, working for the weather service often means working long hours or for many days on end. Every office is staffed 24/7, including weekends and holidays. Local emergency managers can call any time of the day or night to ask for the latest weather information and get help planning ahead for what that weather might mean for their communities. Martin personally worked 13 days in a row around Christmas, without being paid. He says he doesn't mind the work — in fact, he really likes his job and is happy to keep doing it during the shutdown. But, he admits, "it is a bit disheartening to realize we don't know when we're going to get paid again." Recent storms have only added to the weather service workload. "It is the season," says Alicia Miller, a hydrologist and union steward at the National Weather Service office in Pittsburgh. "January and February can be very active to us." That means a lot of time at work, without pay. "I do have two children, and it has been a bit difficult for day care," she says. "It's very hard to explain to day care that I'm working and they have to watch my children, but I'm not going to be able to pay them." For now, Miller says, she has been cutting back on other expenses to afford day care. Miller says employees will very likely be working overtime this weekend to keep up demand for information about a snowstorm moving across the Midwest and Northeast. And while National Weather Service forecasts are still reliable, there is some weather information that forecasters have to do without during the shutdown. For example, Miller says she hasn't been able to access ice and temperature data from the Great Lakes, which can affect snow forecasts in Pennsylvania and other states east of the lakes. And one of the agency's weather prediction models was supposed to be updated at the beginning of January but hasn't been because of the shutdown. 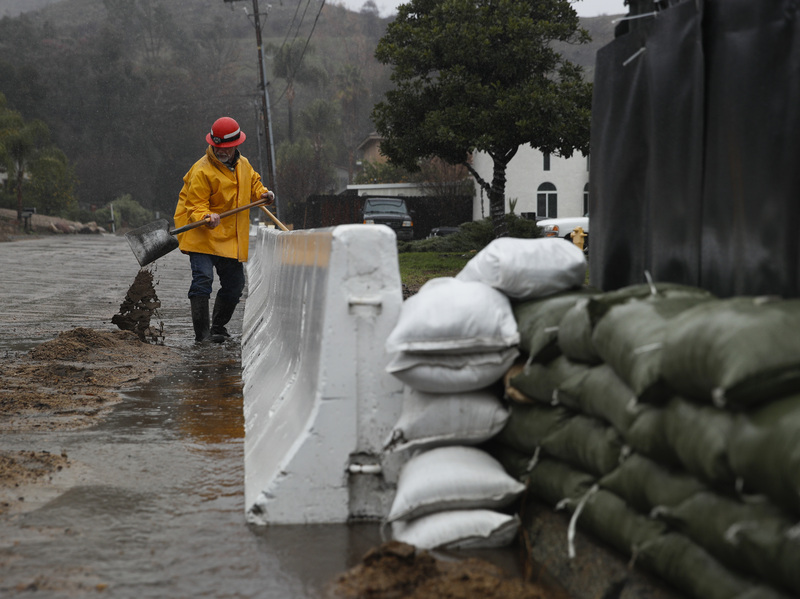 In California, where rain and wind caused car crashes and flooding in some areas, local officials have less flood information than they usually would. Stream gauges maintained by the U.S. Geological Survey aren't being calibrated, which means they aren't necessarily making accurate measurements of how much water is flowing in the rivers. That made at least one local official nervous this week. "We use stream gauge data on a moment-by-moment basis," explains Christopher Berry, the watershed manager for Santa Cruz, Calif. He usually relies on USGS data to know whether the river that runs through the city will flood. "This is the first time I've ever had to say I'm cautious about whether we can rely on the data, because there's no USGS staff working right now," he says. The storm downed trees overnight on Wednesday, and the river rose significantly, but it didn't flood. "I would say we basically got lucky," says Berry. He notes that because trees fell in the river and sediment moved around, the stream gauges are even more in need of calibrations that they won't get until the government reopens. "The next big storm, the gauges will be that much more unreliable."